Quinces are beautiful trees and live to a great age. These trees love to grow in fertile and moist soil. They love an open and sunny position. They are ideal near a stream. They have beautiful large blossoms, fairly late in the spring. A very hardy tree. They usually do best with a companion. I recommend Vranja and Meeches EarlyProlific. This last tree is smaller and more suitable for the smaller garden. The trees, once established need no further attention as they are very capable of looking after themselves. However in the early years it is important to remove crossing branches and any other branches which reduce the entry of light into the tree. The black marking that can occur on the fruits is caused by crossing branches that scar the quinces. 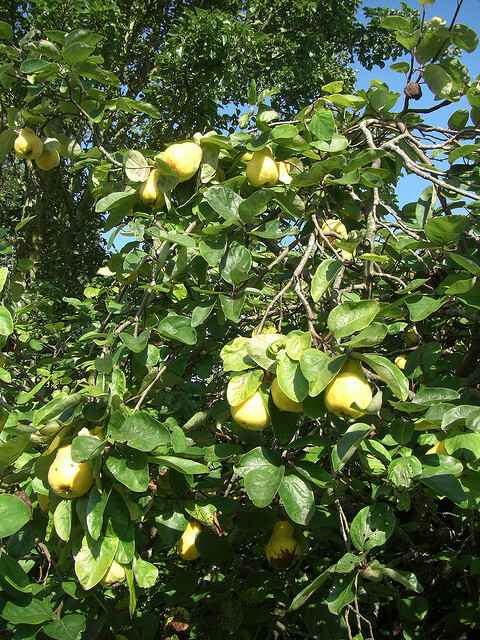 As for all fruit trees, in the early years, it is important to give the quince trees water in very dry summer periods. The fruits are very aromatic and should be stored by themselves, as the quince scent will adversely affect the flavour of other fruits. Store them in a cool, frost-free place. The fruits are superb for the preparation of a large range of dishes either as an addition or by themselves. 3) bake in the oven until soft, for up to 1 hour. 5) use for recipes as required.